Posted on July 11, 2017 at 5:30 am. It seems Europe’s casino bosses are not convinced on the money-making potential of esports and skill-based casino games, deeming them “doomed for failure” and potentially alienating for older customers in a newly published report. 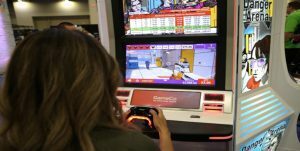 Skill-based gaming machines by GameCo have been employed in the U.S on trial runs, but European casino owners aren’t as keen. GamblingCompliance gathered comments from several gaming executives and owners of high-profile land-based casino venues in Europe in regards to accommodating skill-based slot machines and esports arenas into their gaming floors and facilities, and it seems the general consensus is they are disappointments for both casual players and those seeking more involved gambling experiences. “Skill-based slots are doomed to failure because they annoy gamers who don’t see why they should play their favourite game in a slots version and they disappoint gamblers who want to play a straightforward slot game and feel they are at a disadvantage,” said Simon Thomas, chief executive of Hippodrome Casino in London. Skill-based casino games require some form of decision-making from the player that affects the outcome of the game, and elements of strategy to improve one’s chances of winning. They actively target the millennial generation as a new form of gambling entertainment, given the youth of today have not taken to traditional slot machines or casino games in the same way. Both Thomas and Olders acknowledged the efforts of North American land-based casinos in Atlantic City and Las Vegas installing GameCo skill-based video game machines on their gaming floors to trial their potential popularity, but Thomas was quick to note how fast these GameCo machines were taken off the floors. Meanwhile, despite a booming industry expected to exceed $1 billion this year, European casino owners aren’t convinced on esports just yet. While North American casinos such as MGM Resorts Luxor in Las Vegas have opened up dedicated esports arenas adjacent to their gaming facilities, European gaming executives don’t think it would work quite as well across the pond. Author’s comments: There is a place for both skill-based casino games and esports alongside traditional casino staples. Traditional slot machines, both online and offline, just aren’t cutting it anymore for the millennial generation, and if casinos want to keep the money flowing (and grab a slice of the $1.23 billion predicted to be generated by the esports industry in 2019), they will have to adapt eventually. The European executives have good points about the current potential of engagement both casual players and fans will have with the presentably available skill-based products, but that is up to GameCo and similar companies to improve upon – lower-quality versions of games you can play on your home console just won’t cut it with casino patrons looking to bet real money.